This is an Open PCR Machine. 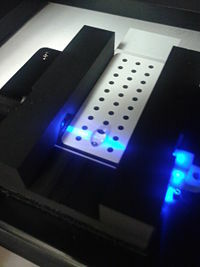 An Open PCR Machine can rapidly duplicate DNA, or in other terms amplify it, as well as attach marker to make traits such as cancer visible. PCR stands for polymerase chain reaction. It works by heating up samples to first denature DNA and create single stranded DNA. Then it cools to allow the primer to attach and replicate the DNA. The open PCR machine starts with an initialization step where the temperature rapidly increases to 95 degrees Celsius to create a hot-start for DNA polymerization that requires heat activation. The second step is to denature the protein, where the first cycling event heats the DNA strands at a temperature of 95 degrees Celsius for 30 seconds to melt the DNA template through the disruption of hydrogen bonding between paired bases, effectively splitting the double stranded helix into two single strands of DNA. The third step is the annealing step where the temperature is rapidly lowered to around 50 degrees Celsius to allow for the annealing of primers. The polymerase then binds to the hybrid of primers with the template to begin DNA formation. Then begins the elongation step, which differs depending on the polymerase used; typically the optimum temperature is around 75 degrees Celsius. During the elongation process, DNA polymerase synthesizes a complementary new strand of anti-parallel DNA. The amount of time required for elongation differs depending on the DNA polymerase used as well as the length of the amplified DNA fragments being used. On average, DNA polymerase amplifies at a rate of one thousand bases per minute. Next is the final elongation step where the temperature is held around 75 degrees Celsius to ensure that the DNA strand is fully elongated and will generally hold for around five minutes. Finally there is an end hold temperature that keeps the reaction at a steady temperature (between four and fifteen degrees) until the amplified DNA is ready to be utilized and further studied. The LCD monitor serves the purpose of informing the user of the temperature of the lid as well as the temperature of the samples. This serves as a visual verification that the program is running according to plan and follow along with the timing and temperatures involved in Open PCR experiments. In this image the heat sink and fan have been isolated from the machine. These are used to keep the machine cool and running. When the cooling cycles begin the fan will increase speed to gradually decrease the temperature. 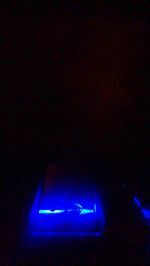 In this image the power supply has been isolated from the machine. The power supply provides energy for all of the components in the PCR Machine. 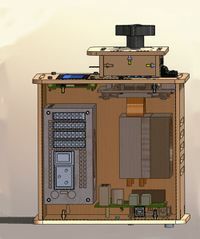 In this image the top has been moved aside so that the sample holder is visible. The sample holder keeps the samples in place while the PCR machine cycles. The heated lid tightens so that the inside of the lid will press against the samples without crushing them to ensure that they are heated quickly and evenly. When the LCD Monitor was unplugged from the Open PCR Circuit Board the monitor lost power. When we unplugged the white wire that connects the Open PCR Circuit Board to the Sample Holder/Heating Block, the LCD monitor incorrectly displayed the temperature. Instead of displaying the correct temperature of 25 degrees Celsius it displayed a temperature of -40 degrees Celsius. 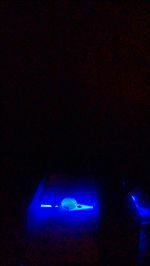 We first tested our PCR machine on 10/18/12. The machine malfunctioned due to lack of heat management and would not cool. It was later discovered that several internal wires were disconnected. A different machine was procured, tested, and found to work. This new machine was used for all of the experiments. The Polymerase Chain Reaction uses multiple heating and cooling cycles to target and amplify a specific piece of DNA in a sequence. This is useful because it allows for millions of copies of the specific DNA piece to be copied, which yields an abundant amount of samples for the person examining the DNA for disease, mutation, or etc. We used three stages for this experiment. Stage one had one cycle heating to 95 degrees Celsius for three minutes, which resulted in the DNA unwinding to a single strand. Stage 2 consisted of 35 cycles. Each cycle of stage 2 was: held at 95 degrees Celsius for 30 seconds (DNA continues to unwind), cooled to 57 degrees Celsius for 30 seconds (primer begins to bond), and re-heated to 72 degrees Celsius for 30 seconds (extension of new copy begins). Stage 3 was held at 72 degrees Celsius for 3 minutes in order to finish the extension of the DNA copying. 1. Gather all components for PCR reaction (template DNA, primers, Taq polymerase, magnesium chloride, and dNTP’s). 2. Place template DNA into a test tube. 3. Add Primer 1 to the test tube. It will attach to the first binding site on one end of the template DNA. 4. Add Primer 2 to the test tube. It will attach to the second binding site on the opposite side of the template DNA. 5. Add nucleotides (dNTP’s) to the test tube. These free floating nucleotides will be used when extending the template DNA. 6. 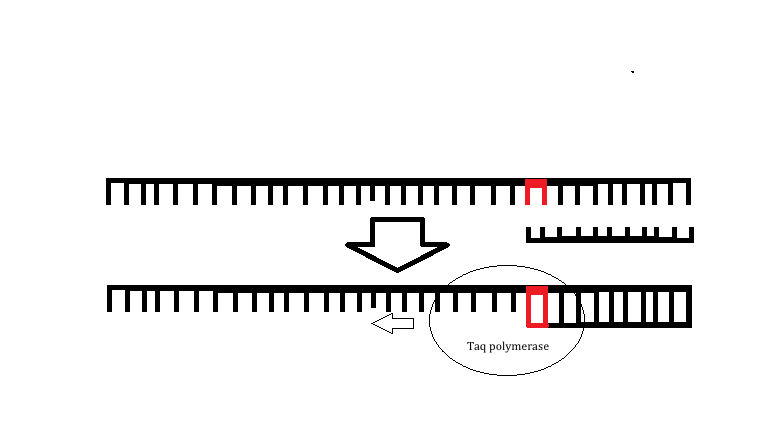 Add Taq polymerase to the test tube. This enzyme will bind to the specific priming site and replicate DNA at the end of the strand by adding nucleotides. 7. Add Magnesium Chloride, a cofactor that will bind to Taq polymerase and allow for greater efficiency, to the test tube. 8. Download the Open PCR software onto the computer. 9. Plug the Open PCR machine into an electrical outlet. 10. Connect the machine to the computer using the USB cable. 11. Place empty PCR tubes into the machine. Close the lid and tighten the screw until it touches the tops of the tubes. Do not over-tighten! 12. Create a new program on the machine that follows: Stage one: 1 cycle, 95 degrees Celsius for 3 minutes; Stage two: 35 cycles: 95 degrees Celsius for 30 seconds, 57 degrees Celsius for 30 seconds, and 72 degrees Celsius for 30 seconds; Stage three: 72 degrees Celsius for 3 minutes; and a final hold at 4 degrees Celsius. 13. Start the new program. 14. Wait for program to run to completion. 1. Obtain a fluorimeter box that contains crucial materials for the fluorimeter assembly. 2. Set up the box "upside-down" so that most of the light will be blocked from the inside. 3. Place the cell phone in the docking area. 4. Place the glass slide over the black container that marks designated areas for the water droplets with black dots. 5. Place the glass slide with container on top of black shelving. 1. Set up the fluorimeter. 2. 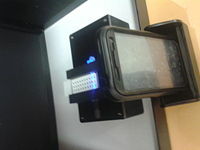 Take picture of the specimen (droplet) using a cell phone camera. 3. E-mail picture to computer that contains Image J software. 4. Save image to computer and upload into Image J. 5. Analyze specimen by "drawing" a circle that outlines the droplet from the image. 6. Save data in Word Excel. 7. Repeat steps 2-6 for all images. The specific DNA sequence that we are investigating is the r17879961 cancer associated sequence. This point mutation will change a thymine in a normal DNA strand to a cytosine in a mutated DNA strand. This mutation will result in an amino acid change of isoleucine to threonine when translated into an amino acid sequence. The primer designed for this single DNA mutation that causes cancer is able to bind to the template strand only if the mutation for cancer is present, which will allow for TAQ polymerase to extend the DNA. If the mutation is not present then the primer cannot bind and will therefore not be able to be extended resulting in a negative PCR reaction as amplification will not occur. The primers that we will use for this specific PCR have a sequence of AAACTCTTACACTGCATACA and CAGGACAAATTTCCTCCTAT. This gives you the probability that someone actually does have cancer. This gives you the probability that someone does not have cancer. The attached link is a downloadable copy of the above tables which serve to further show additional planning, work and calculations. Conclusion = If the DNA concentration was > 1μg/mL then the sample is considered to exhibit a positive result. If the DNA concentration was < 1μg/mL then the sample is considered to exhibit a negative result or no signal. This page was last edited on 15 November 2012, at 07:39.